the decision to print ballot papers in Dubai is final, political parties and stakeholders who are participating in this year’s general elections heard yesterday. And the Electoral Commission of Zambia (ECZ) informed stakeholders that use of mobile phones in polling stations would not be permitted, adding that those intending to make calls would be expected to go outside to make a phone call. Meanwhile, the commission has insisted that the referendum would take place on the same day with the general elections despite a request by stakeholders that ECZ chairperson Esau Chulu engages President Edgar Lungu to postpone the referendum. Responding to the rejection of the award of contract for printing of ballot papers, Justice Esau Chulu told the political parties that as per tradition, the commission would sponsor party agents to go to Dubai and follow the printing, packaging and dispatch of the ballot papers. Justice Chulu said the agents would also witness the landing of the ballot papers and verify them prior to distribution to districts and polling stations countrywide. 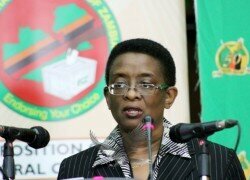 “The Commission notes with regret the increasing levels of emotions and suspicious on the procurement of ballot papers. “It is unfortunate that when ECZ undertakes a public procurement process, where a tender is advertised in the public media for a period of three months, in accordance with the Public Procurement Act and the accompanying regulations and rules to the letter, it is being criticised by stakeholders for doing so,” Justice Chulu said. He said the fact that the bid price for the recommended bidder was far below the average price of all the bids received, and the bidder proved total compliance to all the criteria as set out in the solicitation document, the Dubai firm ranked No. 5 in terms of price out of the 13 bids received. “The evaluation committee, over many hours of work undertook a detailed assessment of the technical as well as financial assessment of the bids prior to concluding that the company in Dubai best fulfilled the technical specifications of the tender dossier and best responded to the pre-established evaluation criteria,” Justice Chulu said.